This is an unusual book by a gourmet mathematician and a self taught cook. 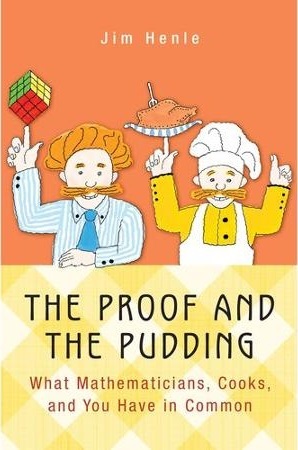 The title "The Proof and the Pudding" is most certainly a double entendre. On the face of it, about half of the book is filled with recipes for the author's chef-d'oeuvres while the other half is devoted to mathematics - the author's puzzlings and mathematical doodlings. The exact proportion is hard to estimate, for the text is interspersed with musings pertinent to both subjects, including instructive confessions of the author - both in the role of a mathematician and a chef - being guilty of all seven deadly sins, gluttony being the most serious offense, naturally. But what is the second, concealed (or implied) meaning of the book's title? This is quite certainly a tribute to the well known phrase "The proof of the pudding is in the eating!" or even more so to its more recent variant "The proof is in the pudding!" One has to eat the pudding to appreciate and enjoy its taste. It's the same about cooking and mathematics: you can't enjoy either unless you try doing it. The second variant may be more relevant: the payoff of any effort (in cooking as in mathematics, in particular) is in the result - the pudding - that you won't be able to enjoy unless you try. This, though, comes with a qualification: the creative process that underlies both activities may not bring the desired result right away, it may take adjustment and perseverance to achieve the goal (pudding, solution to a problem) but, regardless, trying is a prerequisite for enjoyment. And, in my view, the book serves an excellent guide for a novice at both cooking and doing mathematics, solving math problems being just a part of that activity. The author appears to be having a lot of fun - cooking and doing mathematics; his enjoyment is contagious. The book made me try the recipe for a cheesecake, and I can testify that it was worth trying. Seven coins are placed in a row, all heads-up. the left neighbor of the rightmost head. Make your first move! What may it be? The first answer is that I am not going to get serious. I'm just not a serious guy. If you want a serious book, there are many to choose from. I have a list somewhere. The second answer is that I am serious. Doodles, puzzles, and games are genuine mathematics. Despite their outward frivolity, they contain ideas that are subtle and deep. Indeed, some philosophers have argued that all of mathematics - when context is cleared away - consists of doodles, puzzles, and games. I have a feeling that Jim Henle derived great enjoyment from writing this book; likely, but not necessarily so, it was his intention to make the book enjoyable (as opposed to, say, useful, instructive, etc.) to the readers. In my view, this what happened nonetheless, probably, after a good deal of doodling, puzzling, and cooking. The Proof and the Pudding, by Jim Henle.Princeton University Press, 2015. Hardcover, 176 pp, $26.95. ISBN 978-0691164861.